This is the fourth in a series of real-life examples of taxonomies found in my kitchen. Part 4 of “Taxonomy of Spices and Pantries” looks at how card sorting studies can inform a taxonomy. I started this series as a way to share my journey as I organize my kitchen. At this halfway mark, I’m actually quite proud that I’ve made it this far and that you’re here to mark the occasion, so thank you for reading! In the next half of this series, I finally get to start showing you the 80% of the time and effort that goes into taxonomy development. The business value proposition of an enterprise taxonomy/metadata can only be measured by analytics. How much time is wasted in searching and not finding information? How much is that in lost revenue? We started the discovery process for this taxonomy by understanding the project scope and domain. Who are the users? What content is being included or not? What is the primary purpose for this taxonomy? While a final taxonomy is a list of sorts, the sign of a solid, sustainable taxonomy is in its ability to be flexible and scalable. In what ways can this taxonomy be applied in other content or information systems? How do users think about the content and find what they need? Always, always consider the various applications of this taxonomy. If not applied consistently and coherently, developing a taxonomy is a wasted effort from an information architecture perspective. 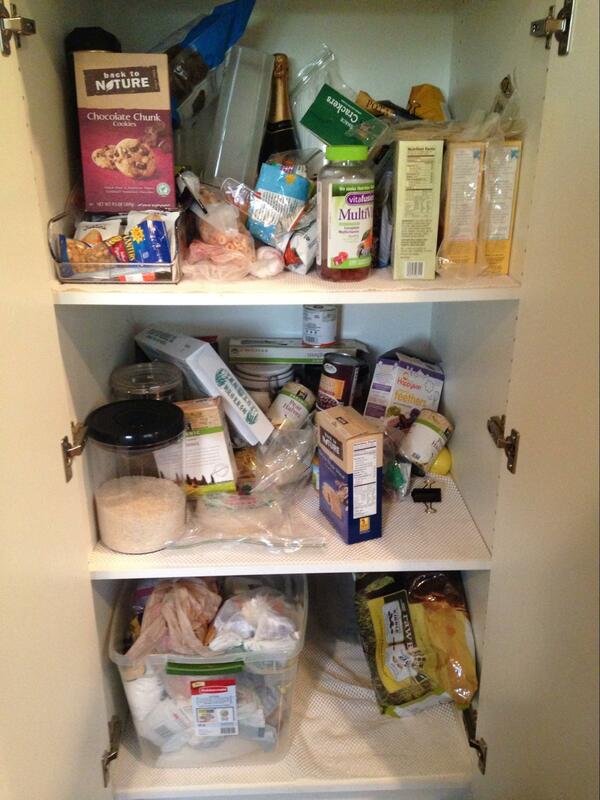 A pantry with no taxonomy in place. Thus, going back to users to validate and confirm assumptions is a fundamental part of the recipe to keep in mind, because all this planning and re-organizing is in vain if my in-laws come back in six months and the kitchen reverts to its original state. In this next piece, I walk through my card sort analysis to further define my next steps. A taxonomy crafted from the business perspective does not last. As the taxonomist, I could arbitrarily create groupings that make sense only to me and be done. Who cares if my in-laws can’t find the corn starch? They’ll just have to ask me and over time they’ll figure it out, right? No! When we moved the first time, this was exactly what happened. I was told to organize the kitchen and I did. Over time, the kitchen reverted to things being stored based on convenience and portability. It wasn’t bad, but it wasn’t efficient (cue three containers of baking soda). Designing only by the business objectives—without user research—is the old way of designing a web site. The lack of research and affirmation from other stakeholders demonstrates how a new look and feel doesn’t make a new system efficient; you must consult your users. Know your content. Create a content inventory. Quantity. Eventually, this column became tedious and I stopped trying to track this. Category/Purpose. In the early stages, I used this to capture the original organizing mechanism used. However, when you’re building your content inventory, this type of additional metadata may be useful information. To determine how much information to capture, go back to your users. Is brand an important facet that your users reference? Is hot sauce referred to as a generic “hot sauce” or the specific brand “Sriracha” or “Tabasco”? 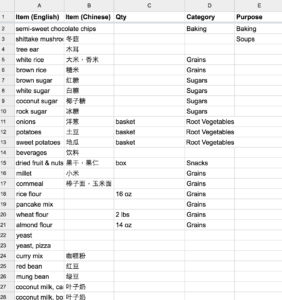 At this early stage, I started assigning items to a high-level category based on the item’s current position in my storage: Flours, sugars, essences and extracts, sauces, vinegars, oils, beans, noodles. Their current placement also implied underlying organization systems. Some items were placed in multiple places (categories). For instance, my father-in-law kept his stash of spices separate from the rest so that he could quickly pull the spices that he frequently needed. This is how we ended up with three bags of baking soda: one my father-in-law kept, one that I kept, and the 5 lbs. of baking soda we bought from Costco. Sometimes items may be available under more than one category. This is called a polyhierarchy, and it happens when there are items that share the same hierarchical parent, such as a generic-specific, instance or whole-part type of relationship. This is perfectly fine in a digital taxonomy. In a taxonomy of physical items, like the spices one we’re discussing, creating polyhierarchies could potentially undermine the navigation scheme and create confusion. Cinnamon, a prime example, can be used in both savory and sweet recipes. Going deeper, curry powder could be classified as an instance (example) of Indian spice as well as a main ingredient in many other Asian curry dishes. If we consider the cultural, geographical and political implications of classifying spices, you’ll find another polyhierarchy. To handle this in a physical taxonomy, it’s best to conduct a tree (navigation) test and see how users tend to associate an item and let your users determine the best placement based on usage. On the other hand, although a digital taxonomy for spices doesn’t have the same restrictions as a physical one, you probably should create rules for when that happens (ahem, that’d be documented in a taxonomy governance guide). There should be a general overarching organization scheme that is logical and easy for your users to follow. If there are too many polyhierarchies, the taxonomy becomes too difficult to follow. Having a clearly defined structure is important so this is another reminder to keep it simple (K.I.S.S.). Validate your assumptions using a representative card sort. How did other people/users organize their kitchen? What labels would they use to name the groups? What things would they consider to be part of their spices/pantry? What other considerations would they have for their spices/pantry? The study was set as an open sort because I wanted to know what labels people used to call those broader categories. I also asked a set of open-ended questions to gather additional information about how participants thought about their kitchen. I narrowed down the card sort to 60-70 items. If I were conducting a moderated, in-person card sort with physical index cards, 200 cards would not have been too daunting. Meanwhile, 200 cards in an online card sort would have felt tedious and never-ending for a card sort participant. I also focused on selecting cards that represented a consistent level of detail. Salt wasn’t just salt. It was table salt or sea salt. Rice was jasmine rice or brown rice. Vinegar was rice vinegar or white vinegar. When you’re setting up your own card sort, be sure to consider your participant’s experience. If I’d had more time, I would have also included pictures and short descriptions of each item. If you’re debating about what to include in your card sort, see Donna Spencer’s Card Sorting book and her article. 64 cards. 288 categories. 36 users. Beginning of a card sort. The card sort ran for about 2½ weeks in February 2016. I shared it across Twitter, Facebook, and LinkedIn. It reached 81 people, of which 44% (36) completed the sort of 64 cards and the questionnaire at the end. I offered one pound of assorted chocolates as an incentive; my son’s school was having a fundraising event. I asked two open-ended questions at the beginning and five open-ended questions at the end of the exercise. I don’t know what I was thinking, but 64 cards x 288 categories x 36 participants x 7 questions = 4,644,864 data points. Pre: What are the top three tasks that you engage in in the kitchen? Pre: What is your primary role in the kitchen? Post: What was your overall approach to organizing the cards? Post: Are you happy with the overall groups that were created? Post: Were there any items that are missing that weren’t included? Post: Were there any items that you would have called by a different name that you recall? Post: Do you have any additional feedback or comments that you’d like to include? Screenshot of my card sort showing all 64 cards in groupings. 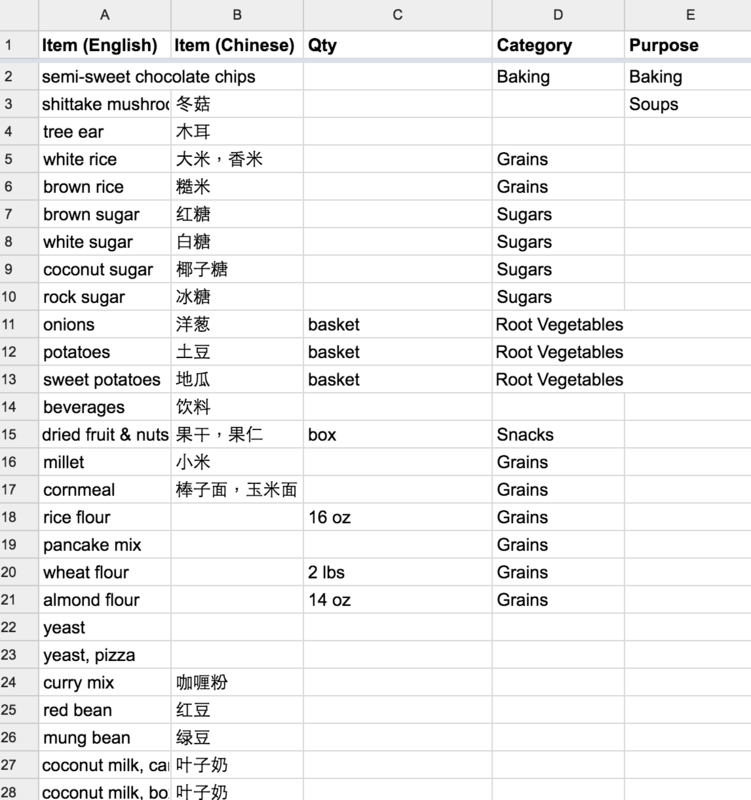 The results told me that I had missed whole groups of pantry items: teas, canned goods, cereals, and granola bars. It made me realize that I was not as objective as I thought. I’m surprised no canned goods made the list. I have found it interesting how people group those things, as well. I’ve seen some give them a specific and separate area (that’s me! ), some people keep them with all wet ingredients, and some people may even keep certain canned/wet things with seasonings. Incidentally, I do have a canned section of my pantry, but it has only tuna fish and tomato paste. Same goes for cereals: We haven’t really eaten cereal until recently. My son came home from kindergarten one day asking for Lucky Charms, so we bought a box and then two more. Quite a few people brought up sauces that I missed, especially Sriracha and Tabasco sauce, because I usually keep those in the refrigerator. Then I noticed that I keep hoisin sauce and oyster sauce in the cabinet close to the stove. Then I realized that I have inconsistent food storage management practices. At the same time, the results told me that I had made a lot of assumptions about the items I use and the people who use them. In the beginning, I had dismissed collecting brand information, thinking that it was all extraneous information. In fact, brand actually plays a big role in how we referred to things. Hot sauce is not just “hot sauce.” My husband prefers Sriracha sauce for rice and Tabasco for eggs. A certain brand’s black vinegar results in better pig trotters than others, which is why recipes sometimes call out certain brands of ingredients. As a result of this finding, I should include brand as part of my taxonomy scope. See that there? That’s scope creep. Check your world views at the door. This is a learning opportunity. Don’t let assumptions stop you from learning how others see the world. Rinse and repeat. 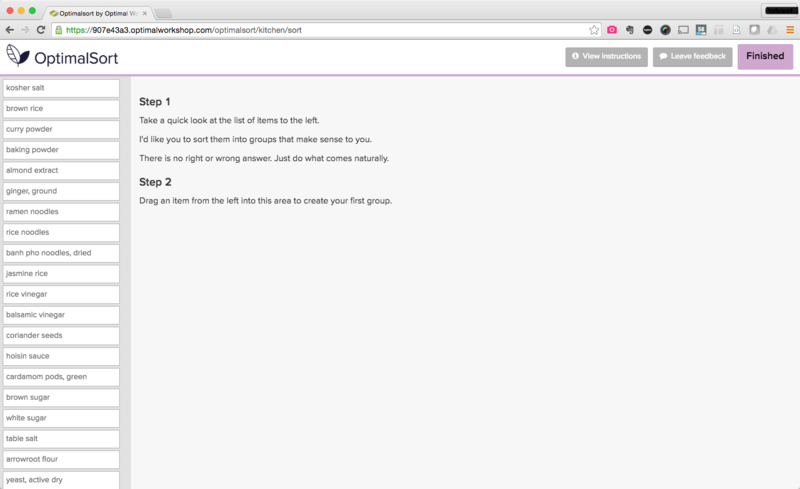 If your categories don’t work or are too broad, modify or test with a subset of cards and try again. Thirty-six participants grouped and labeled the categories in 288 different configurations. Going through the card sort results, I attempted to “standardize” the category names. I lumped together the categories that didn’t have unique labels or unique cards in the groupings. From these, I tallied up the organization schemes that the standardized categories followed. These revealed other useful information to factor in the taxonomy. Category names that spoke to an item’s function and the items that were grouped together in those categories turned out to be a subtle teaching opportunity. For example, when I investigated the category name “leavening,” I learned why baking soda and baking powder are added in baking recipes. 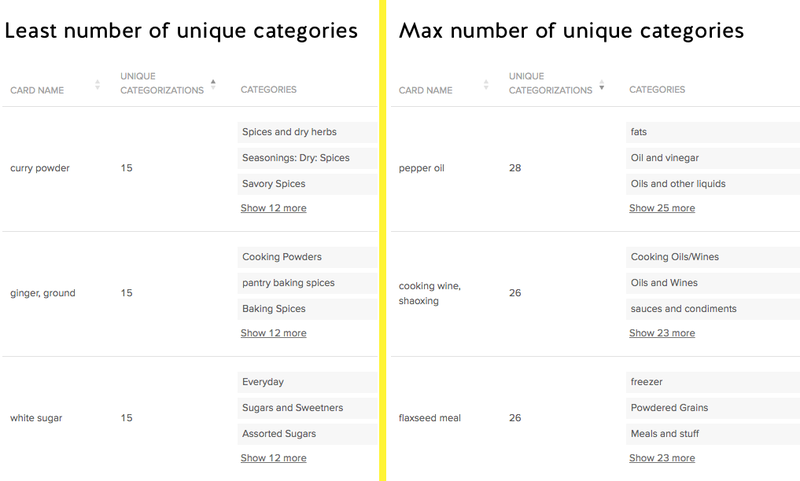 The least number of unique categorizations was for curry powder, ground ginger, and white sugar. Of 36 participants, these had 15 unique categorizations, meaning that this card was sorted into 15 unique categories by participants. Each category may have a different composition or label. Compare this with pepper oil, cooking wine, and flaxseed meal which all had more than 25 unique categories. Having fewer unique categories implies that participants have more agreement on the label of the category. More categories may suggest more varied interpretations of the item and the categories in which it may live. Side by side view of cards that have the least and most number of unique categories. Looking through the groupings, there were a few other groups that had some element of temperature. One person placed flaxseed meal in the “freezer” which I had not done. Other things that were grouped for the refrigerator category included active dry yeast, fish sauce, soy sauce, and cooking wine. My parents never stored soy sauce in the refrigerator, and so I followed suit. Maybe there should be a mini-fridge for all these sauces next to the stove? Following this, I intend to include “storage handling” as another property to track in my taxonomy. And of course there were distinctions that people brought up around herbs—fresh, dried, and ground—that weren’t called out in the cards. A couple participants indicated in the post-exercise survey that their current organization scheme is dictated by the amount of available space and size and weight of the item’s container. As a category, “condiments” had a wide range of items—from 2-17—and the items didn’t overlap so much. I had to look up the word “condiments” to make sure I understood what it meant. My mental model limited ketchup, salt, and pepper as things that people can add after food has been prepared. Apparently, condiments are additives during or after preparation to enhance flavor, and the category could then include soy sauce and Sriracha as well. 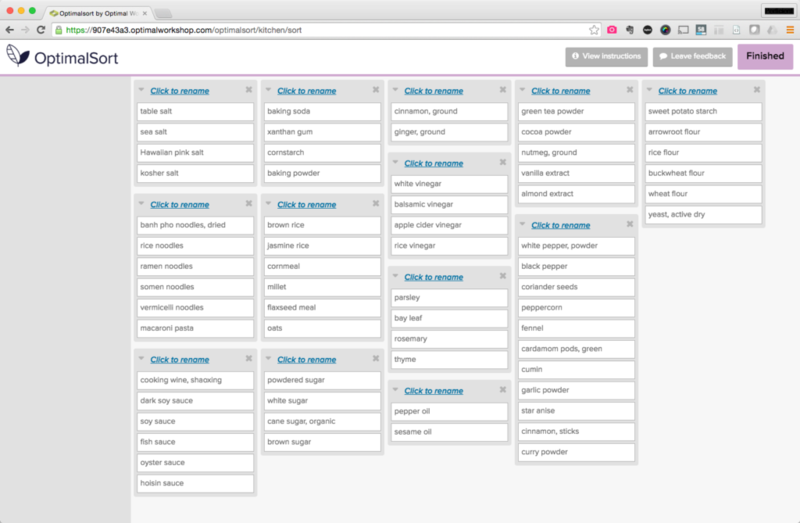 When you’re building a taxonomy for a client… well, in an ideal process, term research is an activity that should come before user research to evaluate taxonomy. However, user research is the non-expert technique to understand how users, not experts, relate to terms. Ultimately, you should defer to terms that your users are using. Of course, the number of cuisine categories is limited to the cards in the exercise, which was based on my own cooking habits and my kitchen inventory. The results also revealed the different approaches that participants had toward their kitchens and their cooking. One participant named a category “Advanced spices.” Was “advanced” referring to a higher level of understanding of cooking? On what basis? Was it used in special dishes for special occasions as opposed to an everyday home-cooked meal? Was it referring to a complex flavor that is not usually encountered in homecooking? As you can tell, this could only get so far with remote testing and no way to ask questions. In a moderated card sort, this would be a great opportunity to ask for clarification around “everyday” and “daily.” Does this mean there is a basket of rarely used spices tucked away somewhere? Where you draw the line before smaller, unique categories turn into larger, discernible categories is subjective. Sure, the grocery store has a huge section for produce, but even within the produce section there are lines between root vegetables; green, leafy vegetables; and fresh herbs. But this distinction varies by the situation. If you follow the diagram below, you’ll notice that the flours eventually merge with the noodles and pastas; vinegars, sauces, and oils merge into cooking liquids. When do you stop combining categories? Use your best judgement at this point. Some participants mentioned that they’d like to see more granular groupings of herbs. There are definitely more items that are missing from the set of 64 cards. In fact, I’d expect that the average kitchen has at least four times the amount of stuff listed here. As I mentioned before, this particular card sort is based on the contents of my personal pantry and spices collection. Many participants mentioned that there’s hella more in their own pantry, and I say, of course! I’m only asking for 20 minutes of your time and so keeping the list to a select 60-70 would help reduce fatigue. Even for an enterprise project, you may want to consider limiting the number of cards in a remote (unmoderated) card sort. In a moderated card sort with physical cards, however, up to 200 cards is manageable in individual card sorts (not team card sorts) if the cards cover broader topics that are easier to group. As you work through your card sort results, you may find that your understanding of the domain is not enough. Your findings can actually shake up your prior experience. In doing this card sort, I am humbled by how little I knew. What do you think is the most useful purpose for a kitchen taxonomy? Being able to find things was most important. Here is a breakdown of the importance for the purpose of the kitchen taxonomy. What are the top three tasks that you engage in the kitchen? What is your primary role in the kitchen? This was another open-ended question and the responses quickly illustrate how one’s role in the kitchen may also dictate their importance in the household as well. The Grand Overseer. The Key Master and Gate Keeper, both. GOD. In developing the questions for your own card sort, think about how the answers to your survey questions might affect the final taxonomy design. The categories created have to be relatable to all users of the taxonomy, which not only includes the people who cook but also those who put things away. When I first looked at the results three months ago, I cringed. I fretted over the questions that I asked, that I should have asked. I agonized over what I wanted to find out, what I could have found out. I was in a rut to figure out how this analysis could have ended up. I could have, should have asked in the post-test survey some quantitative questions, such as participants’ level of satisfaction with the groupings. At the end, I realized that it was enough. What matters is that I learned a lot about who I am, what I was trying to do, who the users are, and what was important to them. And I will learn more about them as I continue my process of validating this kitchen taxonomy. Meanwhile, I will continue to develop the terms in my taxonomy. In the end, everyone’s kitchen taxonomy is subjective to their own models of understanding and personal approach towards food. Your kitchen taxonomy is not my kitchen taxonomy, but I will be asking you to find things in mine. Block party! I have an upcoming milestone: My in-laws are coming back from their half-year in China next month. 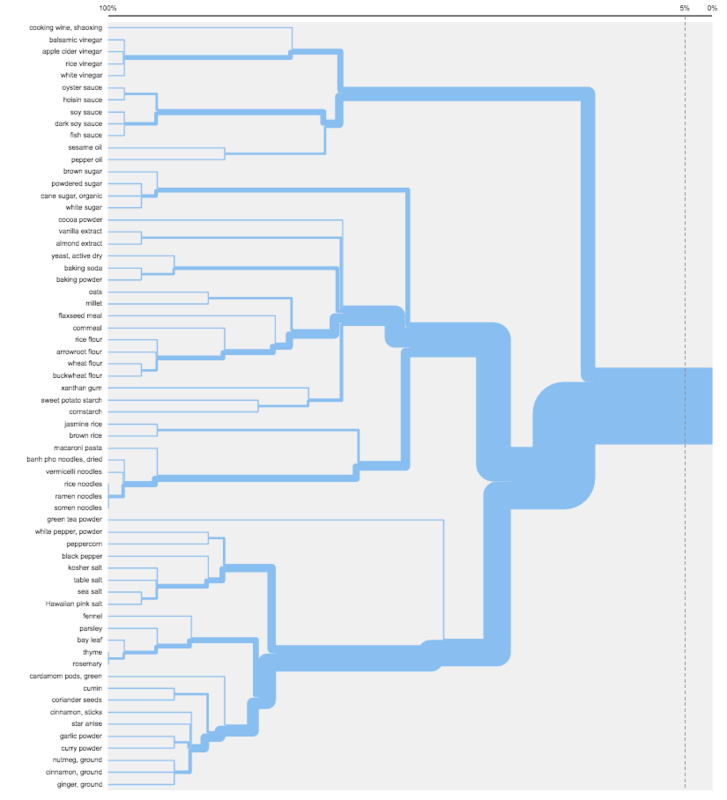 I’ve set up a tree test to evaluate the taxonomy that I have so far (closes June 30, 2016). My next post will walk through tree testing the kitchen taxonomy. Follow me on twitter @lauggh to get the latest update! Grace is an Information Architect at Perficient's Experience Design agency, Perficient Digital in drought-ridden, sun-baked Southern California. 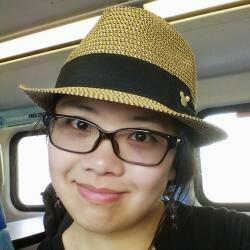 She received her MLIS from UCLA, where her graduate portfolio focused on information-seeking behavior in online communities, gaming, and communities of practice. Since then, she has 9 years experience working in-house and as a consultant doing both strategic and tactical design. She has worked on large intranets and websites, eCommerce and search systems, a content management system, and a mobile app. When she's not working, she's organizing clothes, sorting Lego bricks, and working on a controlled vocabulary on Asian dramas. Find her on LinkedIn and twitter @lauggh.